AMARC Calls for Communication Rights for All! World Press Freedom Day in Cameroon For World Press freedom Day, on May 3rd, 2011, the World Association of Community Radio Broadcasters AMARC, highlights that civil society broadcasters are the new frontier of communications. These women and men broadcasters play a fundamental role in situations of conflict and natural or climate change related disasters; in protecting and giving information to populations and in reconstruction processes. AMARC calls upon States and governments, and press and audiovisual regulatory authorities to respect their engagements for press and audiovisual freedom of expression. Community Radios all over the world should be able to develop and work in safe economic and legal environments. Their broadcast rights should be further recognized and reinforced. Community radios are the ones that allow the excluded and marginalized – particularly women and the poor – to express themselves publicly and these should be further recognized by the international community. Civil society mobilisations and constitutional reforms in Arab States create unique conditions to go from a situation where authoritarianism and corruption as well as large Telecom interests to a fair and equitable allocation of frequencies in favour of civil society media, including community radios. 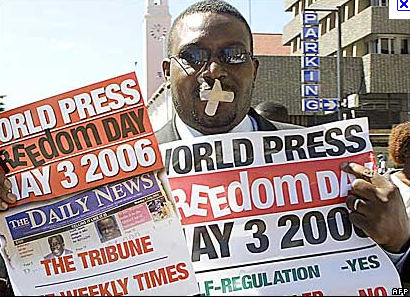 AMARC salutes the 20th anniversary of the Windhoek Declaration that stresses the importance of press freedom in the reinforcement and preservation of democracy as well as for economic development and calls for an extension of independence and pluralism of the press to radio and television. AMARC calls for the establishment and reinforcement of audio-visual regulatory authorities that are independent from governments, private consortiums and Big Telecoms as well as their inclusion in the constitution. These are essential conditions for broadcast that respects pluralism and freedom of expression.